I am enjoying dark mode in macOS Mojave. This includes the list boxes and sidebar in the Notes.app. Except, the note sheet itself is awkward with white-text-on-black-blackground. Is it possible to keep most of dark mode except the content of each note? Yes, indeed, you can display your note sheets in Notes as black-ink-on-white. Go to Preferences dialog box. While I did not notice it immediately, you can find a checkbox under the text-size slider. That checkbox is titled Use dark backgrounds for note content. Uncheck that box. Not the answer you're looking for? 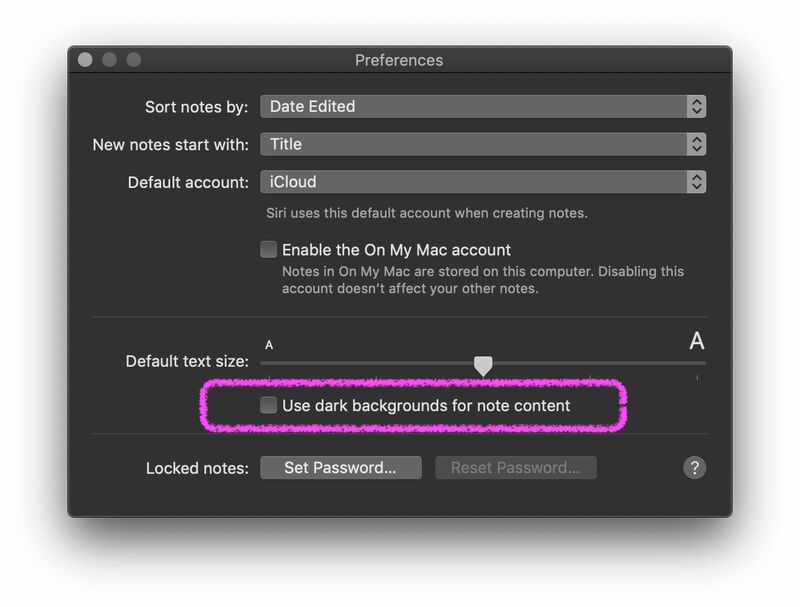 Browse other questions tagged macos mojave user-account notes.app dark-mode . How do I import a Reminder.app lists into a Notes.app checklist? Can I turn to Dark Mode only for specific apps in macOS Mojave? Changing Text Color in Finder on Mojave Dark Mode? How can I keep light mode for Google Chrome while using dark mode in Mojave?